This week I made some really tasty things!! The inspiration for this week’s dinner came from Isa’s Blog. For the House of Dreams benefit dinner, Isa made Temeph over Kale, with mushroom ragout, and stuffed acorn squash. I really wish I was in Portland so I could have went to this dinner. I decided to recreate what Isa made myself based on that photo. I made the best tempeh I ever tasted! It was so tasty. I made a simple marinade to marinade the tempeh in and I boiled it in a soy sauce and water mixture which I think really helped the flavor. I then panfried it until nice and golden! I served the tempeh was a mushroom ragout which really complemented the tempeh. I also had spinach under the tempeh. 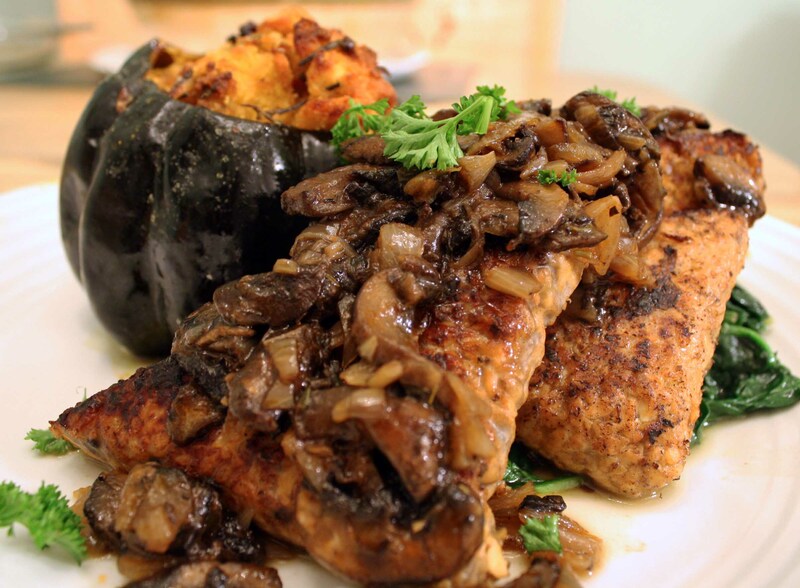 Here’s the recipe for the tempeh and mushroom ragout below. Cut each block of tempeh in to 4 triangles. First cut it across in the middle then cut the two squares diagonally, into triangles. Bring a pot of water to boil and add some soy sauce to it about 2-3 tablespoons to the water. Add the tempeh and boil on medium for about 10 minutes. Meanwhile, combine all the other ingredients for the marinade. After 10 minutes add the tempeh to the marinate and marinate for about an hour or more if you want. After it has marinated, heat a pan over medium high heat with olive oil for pan-frying. Pan Fry the tempeh until golden about 2-3 minutes per side. Heat a pan with olive oil over medium heat. Add the shallots and saute for about 5-8 minutes, until they are translucent. Add the herbs and tomato paste. Then add the mushrooms and wine or vegetable broth and saute for about 8-10 minutes until the mushrooms have reduced. If it seems a little dry add more wine/vegetable broth. Season with Salt and Pepper. For my acorn squash, I used Isa’s recipe for Cornbread Stuffing with Pears and Pecans and just substituted some ingredients based on what I had. For example I use rosemary instead of thyme, apples instead of pears, and shallots instead of onions. I also added some carrots and celery and omitted the celery seed. Oh and I halved the recipe. I really suggest Isa’s recipe for cornbread stuffing, it was so tasty! I will defiantly make this stuffing for Thanksgiving! Now let’s talk about the acorn squash itself. It was my first time having acorn squash. I was very surprised with the taste, it tasted so different from the other squashes. It was good but I think next time I will roast it with earth balance and maple syrup for extra goodness! I also made some awesome baked goods this week. I made a really awesome bundt cake from Veganomicon. I made the Coconut- Lemon Bundt cake. This bundt cake was so moist and full of lemony and coconut flavor! I think it was the most moist cake when I have ever had. I will defiantly make this again! I made my very first apple pie! It came out really good! I even made a lattice crust for it. The only thing I will probaly do next time is reduce the spices I used in the apple filling. I need to work a bit more on my crust though. This apple pie went really fast. I only had a slice and I wanted more!! I can’t wait to make this again for Thanksgiving. Let’s hear it for tempeh! I was lucky enough to eat that dinner, and it was worth every penny! no way! 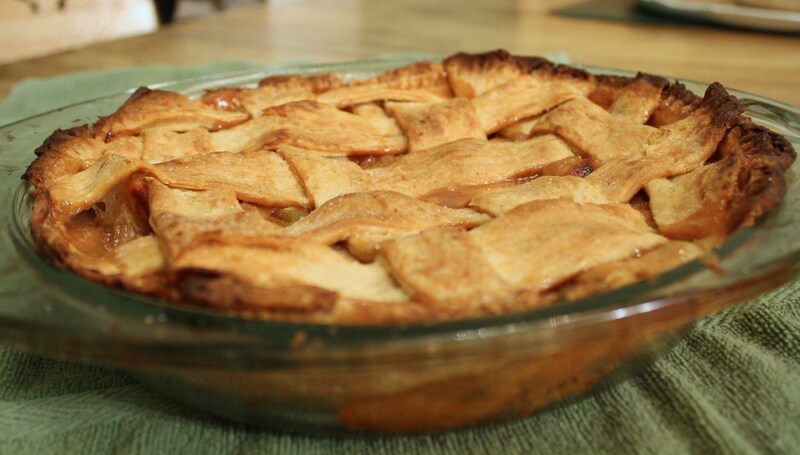 I can’t beleive your first apple pie looks like that…!!! you should see how crapy my pies look. and their not my first..
Wow! That looks like a Thanksgiving menu. Seems that everything came out really wonderful! 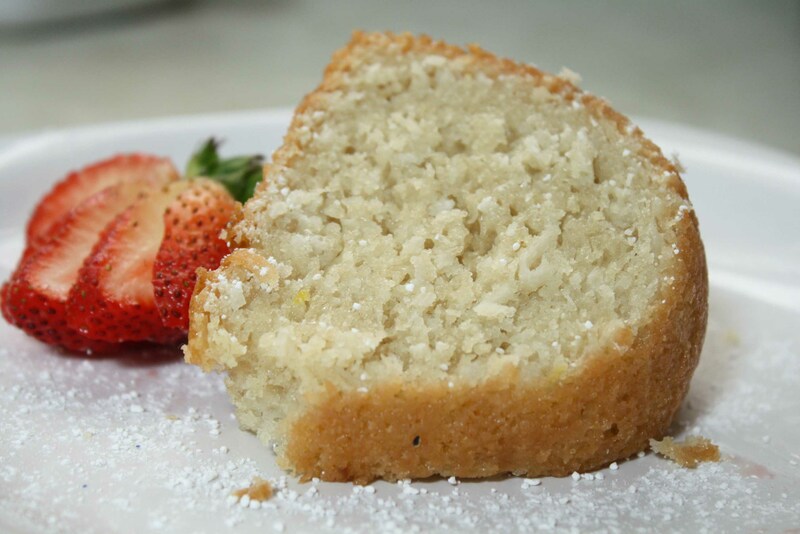 Do you mind sharing the lemon coconut bundt cake recipe? That coconut lemon cake and apple pie look scrumptious. This looks great!! The cake and pie look very good too. Why would you buy a one item cookbook? Believe me, this book will delight every apple lover and convert those who disdain this juicy fruit. Beginning with the crust recipes, Ken Haedrich won me over. I recall my childhood days in Vermont when warm apple pie was served with Cabot cheddar cheese. Pie a la mode was for the tourists. Well, I tried the Cheddar Cheese Crust and all I can say is…YUMMMM! As I perused the recipes, I kept returning to Apple Cheesecake Pie and I finally succumbed. What I was looking for was a simple recipe for a dessert to take to a party or to serve to guests. I must confess that the first time I made this, I did neither. I kept it ALL for myself!! My hedonism aside, this is a keeper! The directions are simple and most of the recipes have only a few ingredients. The crust recipes alone more than justify the price. But you will keep coming back…I know I will…and do! These recipes inspired me. I just made the pan-fried mushroom ragout AND the stuffed acorn squash. Yum. Thank you for sharing.